check the highlighted trade involving Jason Hirsh. Deadline Trades affect Card Shops too. Check out the scroll line message below from one Philadelphia area Card Shop. This is a page from Carl's Cards where you can read the full message. I have picked up some cards and supplies there in the past. They have a mix of singles, packs, and vintage - but I think that the real $$ is made off there Memorabilia and plaques. I have not been to one of their signings yet, but give them credit for getting a message out to let their fans know this signing had been canceled. Checked out a local card show at the Concorde Mall in Wilmington Delaware. Best part of the show was meeting PTBNL/Patsearcher-Greg, the author of In Search of Pat the Bat. Greg was the winner of the 2009 version of the Spot the Sig! contest and announced that he will be back to defend his title this fall. It was good to meet a fellow Phils collector and blogger. 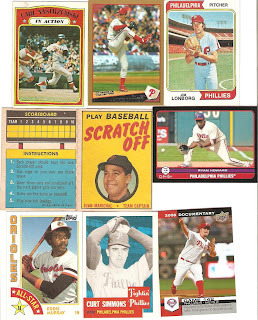 We batted around a couple of collecting and blogging topics, and of course discussed the Phils past and Present. We were also able to take in part of Saturday's Cards v Phils game on TV and got to see Jimmy Rollins' Grand Slam! Greg is much more in touch with the cards from the years prior to my return to collecting and it was good to get some insight on those sets, inserts, and the all the related parallel variations. The Yaz, Moyer, Marichal, and Howard cards came out of the insert box. The rest of the cards were out of dime boxes. Quick Summary: It is always good to get cards of vintage HOFs especially pre-1974. The 72 In Action set is a fun set too. The #d Gold card will be a nice addition to my emerging Jamie Moyer collection. The Longborg was one of many Phillies that I picked up as I try and build the entire Topps run of Phils cards. I didn't have any of the Topps Scratch Off cards. I am not sure if I will be collecting O-Pee-Chee this year but the Black Border was to nice to pass on. Eddie Murray is for the HOF collection. Curt Simmons is an underappreciated Pitcher from Phils past and finally the Documentary will go into the Phungo Games collection. The Concorde Mall Show consisted of about 20 maybe 25 tables. The few dealers that I talked to felt Saturday was down, but they seemed to think they had done well on Friday Night. Team Phungo has learned from a National Sports Network that Phungo will remain a Blogger. The Phils just finished playing the Marlins in a three game set in Florida (didn't go well for the fish) and this week will be entertaining the Chicago Cubs. And who better to talk about the suddenly Hot Cubbies and struggling Marlins then one of our favorite South Florida Card Bloggers, but Brian from 30-Year Old Cardboard. 1) You are both a Cubs and a Marlins fan. This probably affords you a unique perspective on the 2003 NLCS and the Moises Alou/Steve Bartman play. Can you elaborate on your thoughts on the events? Let me start by saying that I was thrilled that the Marlins won that series and eventually the World Series title. Even at the time, I saw the 'Bartman Play' as just another fan interfering with a ball that could have been caught by a player. It just so happened to be in Chicago and at Wrigley. Anything there gets amplified and once the game and series ended all of the blame went to a guy that did what any of us in those seats would have attempted to do. Sadly, Cubs fans attacked him and his life was hell for quite some time afterwards. It's just another thing that Cubs' fans have hung their hats on, and until they get that victory in the World Series, they will continue to place blame on 'other' things besides the team's performance. 2) You have completed the 1983 Super Veterans Subsets, what classis subset would you like to complete next? 3) You have delved into both Vintage and autograph cards as a player collector do you have a preference for either type of card? Absolutely. While autograph collecting has been a big part of my collecting habits in the past year, nothing beats obtaining a vintage card. And if you can find that 'special' one in good, great, or mint condition there is a sense of pride about adding it to your collection. 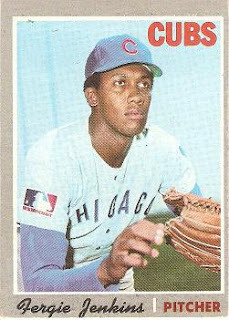 Grabbing a card of Fergie Jenkins or Billy Williams that is 40 years old and in good condition is so much better than any of the autographs I have aquired from the modern certified autograph craze. 4) If the Marlins have a Sell off what player would you most like to see on the Cubs? 5) "Hill Street Blues" or "Miami Vice"
Sport Jackets and no socks rule - Miami Vice!!! I was a big fan of the show when it first came out and although I never watched Hill Street Blues, I doubt that it had the same kind of cultural impact that MIami Vice had during the 1980's. Crockett and Tubbs 4-ever!!! Good Stuff. I am more of a HSB guy then Miami Vice, but Brian came up for some solid reasoning for his position there. I am also a big Josh Johnson fan - he is the ace of the Phungo Fantasy Team. 5 out of 5 for 30-Year Old Cardboard. Thanks to the team over at 30-Year Old Cardboard and keep those Did You Knows? coming. For a look back at a previous Phungo 5 on the Florida Marlins click here for Wax Heaven's state of the team back in May. The 09 World Baseball Classic redemptions are starting to pop up. This is the redemption card Cuban Center Fielder Yoennis Cespedes. Cesepedes is 24 years old and had a pretty good WBC, with 11 hits in 24 at bats (.458) over six games. Six of his 11 hits went for extra bases including 2 dingers, yielding a gaudy 1.000 slugging percentage. The cards are similar to 09 Topps Base with a light chrome finish. The WBC Logo is in the lower left corner and with the country the player represented above the players name where the team is listed on a base card. The Cuban flag is placed upon home plate where the team logo is on the 09 Topps card. The photograph is pretty interesting, it appears that Cespedes broke his bat on the pitch. This on one hand is a pretty cool moment to capture, of course on the other hand this is supposedly a special card of a significant player of some merit and it would nice to see him displayed more favorably. Also this appears to be from one of the games Cuba played versus Japan - which were both losses for Cuba, the second of which eliminated the Cubans. Click this image to enlarge it, but the cards are basically similar on the back. There is obviously no Signage/Acquisition information on the Cespeedes card. Which also only lists the place of birth for Cespedes and no residense. The Cuban flag is placed on the bases as the Team logo is on the base card. The WBC Logo is at the bottom of the card where the MLB/MLB PA logos are on the Blanton Card. The Card number is in the upper right - For Cespedes the card number is 8, but my redemption number was 6 - It would have been nice to get Redemption 8 though. 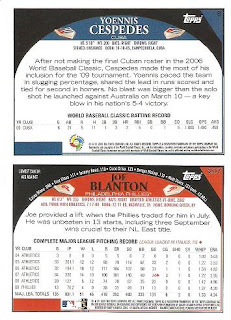 There is no trivia tidbit on the WBC card (The Lowest BA against on the Blanton Card). The Stats on the WBC card are from the 09 Classic. This was the first WBC for Cespedes, perhaps the other redemptions have career WBC stats. The blurb on Cespedes card notes a Home Run he hit off Damion Moss in Cuba's 5-4 Victory over Australia. For a report on Team Phungo's WBC experience click here. And for a look at some other WBC cards click here. Some other card blogs featuring WBC redemptions. The complete list of redemptions is located here. I am sure most of us cannot afford to go to the All-Star game or the Home Run Derby, but there is one event that is part of All-Star weekend that a baseball fan of lesser means may be able to attend. That event is the Futures Game. I have been to two Futures games, 2006 in Pittsburgh and last year at Yankee Stadium. It is a great opportunity to see several players from the next generation of superstars all in one day. It has only been three years since that 06 Futures game yet the list of notables that have emerged from that game is already pretty formidable: Gio Gonzalez, Yovani Gallardo, Alex Gordon, Josh Fields, Stephen Drew, Hunter Pence, Troy Tulowitzki, Phil Hughes, Joey Votto, Cameron Maybin, Pablo Sandoval, Yunel Escobar, Ryan Braun and sadly the late Nick Adenhart. For a Card Bloggers view of the 2009 Futures Game in St Louis click here to find out how the squad over at Autograph Cards made out this past weekend. 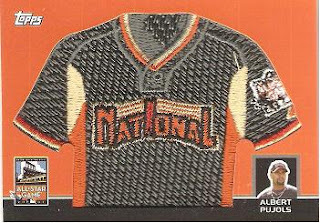 Sloppy Topps - 2008 All-Star Game Patch "Relics"
Last year, this was my "Hit" from a Jumbo Hobby Box of 2008 Topps. 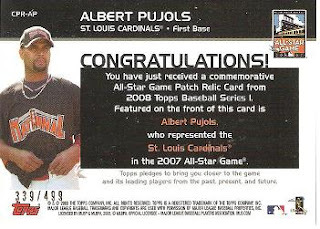 While I admit that it is a fun one to bring out for the All-Star game in a year that Pujols plays the Mid-Summer Classic in his home park, it is in my opinion a really really weak hit. It is not game worn or event worn, in fact its not anybody anytime worn. On top of the commemorative mumbo jumbo they tell me the player featured on the front is Albert Pujols, never mind the fact that the photo on the front is an edit from the one next to the caption itself. Moving on to tonight's game - The NL has lost this game every year since 1996, when the game was in Philadelphia. I was fortunate enough to go to the game, which may have been the most lackluster in history. There were tons of no-shows including Ken Griffey Jr, The guys that did show included such stars as Roger Pavlik, and Rickey Bottalico was the Phils lone rep. However the game did have it's moment. Local product Mike Piazza hit an Upper Deck Homer that helped give the NL the victory in a 6-0 shutout. I would love to see a St Louis local product named Ryan Howard have a similar moment in tonight's All-Star game and get the Senior Circuit back on the winning side of the ledger. Ok there are not a lot of these 2008 Topps Commemorative Patch Relics in the recently finished sales on ebay but I did find a couple and to be honest they went for a lot more than I expected. All the cards above are #d to 499 with the exception of the Fielder card which was 274/379 for some reason. All prices include S&H Charges, which for the Peavy and Fielder cards made up the bulk of the price. Time to get fired up for the All Star game which is a week away in St Louis. Baseball is a very parochial sport, we tend to know a lot about our own teams and very little about the other teams except for big stars like Albert Pujols. But we do tend to know a thing or two about our favorite teams division. This got me to thinking - what would the NL East All-Stars look like. Most of these I could pick out without even looking at the numbers and I think they are pretty accurate. RHP Josh Johnson - showing what he can do when healthy, He is keeping the Marlins afloat and is the anchor that makes their young pitching staff dangerous. LHP Johann Santana - despite some inconsistency is likely the Mets first half MVP. 3B David Wright - Despite power drop, Best of the candidates at a strong position. RF Jayson Werth - This one I had to check - but he's the best this year - definitely a lack of production in the position in the division. Set Rafael Soriano - Honorable Mention Ryan Madson - he was having a great year before getting moved into closer role. 3B none I cannot dishonor Pedro Feliz here. LVP - Jim Bowden - It takes a siginificant amount of effort to put together a team as bad as the Nats. Cy Yuk - Oliver Perez - could have been Phils Starting Staff but they have been better last couple of weeks. What do you think? are the NL East All-Stars and Yuk Stars? Are there any other nominees? Is anyone interested in publishing their own divisions All Stars and Yuk Stars at the break?? 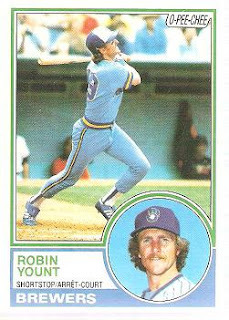 I have a bunch of stuff going on today, so I am mailing this one in a bit, but still wanted to take time to Recognize Robin Yount on the 20th anniversary of his 2500th hit. Yount was inducted into the Hall in 1999. He collected 3154 hits during his carreer which was spent entirely with the Milwaukee Brewers. He won 2 MVP awards at two pretty different positions, Shortstop and Centerfield. Also in honor of Canada Day yesterdsay we have an O-Pee-Chee card up.